UNDATED - For the week ending Sunday, showers and thunderstorms early in the week brought much needed precipitation to parts of the State, according to the USDA's National Agricultural Statistics Service. Localized damage from wind and hail were reported as some storms turned severe. Rainfall amounts varied significantly. Precipitation in many areas of South Dakota remained below normal for the year. There were 5.1 days suitable for fieldwork. Topsoil moisture supplies rated 22 percent very short, 33 short, 43 adequate, and 2 surplus. Subsoil moisture supplies rated 22 percent very short, 33 short, 44 adequate, and 1 surplus. Winter wheat condition rated 22 percent very poor, 28 poor, 32 fair, 18 good, and 0 excellent. Winter wheat headed was 98 percent, near 96 last year, and ahead of 79 for the five-year average. Coloring was 31 percent, near 28 last year. Spring wheat condition rated 28 percent very poor, 36 poor, 23 fair, 11 good, and 2 excellent. Spring wheat jointed was 93 percent, equal to last year. Headed was 65 percent, ahead of 48 last year, and well ahead of 40 average. Coloring was 1 percent. Oats condition rated 14 percent very poor, 22 poor, 31 fair, 30 good, and 3 excellent. Oats jointed was 94 percent, near 92 last year. Headed was 74 percent, ahead of 63 last year, and well ahead of 52 average. Coloring was 15 percent. Barley condition rated 29 percent very poor, 36 poor, 32 fair, 3 good, and 0 excellent. Barley jointed was 88 percent, near 84 last year. Headed was 55 percent, ahead of 39 last year. Corn condition rated 4 percent very poor, 13 poor, 34 fair, 46 good, and 3 excellent. Soybean condition rated 5 percent very poor, 11 poor, 36 fair, 45 good, and 3 excellent. Soybeans emerged was 97 percent, ahead of 89 last year and 88 average. 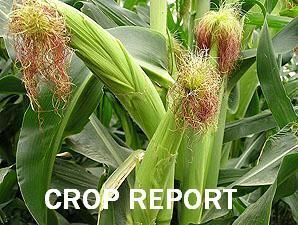 Sorghum condition rated 14 percent very poor, 20 poor, 52 fair, 14 good, and 0 excellent. Sorghum planted was 95 percent, equal to last year, but ahead of 87 average. Emerged was 63 percent, behind 70 last year, but near 59 average. Sunflowers planted was 92 percent, ahead of 78 last year, and well ahead of 69 average. Emerged was 61 percent. Alfalfa hay condition rated 39 percent very poor, 34 poor, 18 fair, 8 good, and 1 excellent. Alfalfa first cutting was 73 percent, ahead of 68 last year, and well ahead of 48 average. Pasture and range condition rated 23 percent very poor, 26 poor, 27 fair, 22 good, and 2 excellent. Stock water supplies rated 11 percent very short, 25 short, 62 adequate, and 2 surplus.